The Federal Transit Administration helped celebrate the opening new Bus Rapid Transit or BRT line in Jacksonville, FL, on Dec. 3, while also finalizing a $149 million Full Funding Grant Agreement or FFGA with the Orange County Transportation Authority for the Orange County Streetcar – formerly known as Santa Ana/Garden Grove Streetcar – in California on Nov. 30. 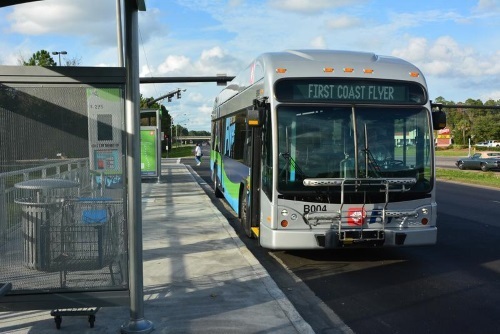 The new 18.5-mile long East Corridor BRT Red Line is the fourth of a five-segment First Coast Flyer BRT system planned by the Jacksonville Transportation Authority. The FTA is contributing $16.9 million or 50 percent of the $34 million total cost of the East Corridor project through its Capital Investment Grants or CIG Program. The remaining project costs are being covered by the Florida Department of Transportation and the JTA. The project will serve Regency Mall, the south campus of Florida State College-Jacksonville, the University of North Florida, and Jacksonville Beach, enhancing regional connectivity by providing better access to educational and employment opportunities in downtown Jacksonville and throughout the Jacksonville metropolitan area, noted JTA Chief Executive Officer Nathaniel Ford Sr. in a statement. “Already the largest BRT network in the Southeast, the new 18.5-mile Red Line nearly doubles the footprint of the existing First Coast Flyer Blue and Green lines and connects more people to jobs, education, healthcare and entertainment,” he said. Separately, on the other side of the country, FTA noted that it is provides the OCTA with a $149 million FFGA via its CIG program as well – the third FFGA signed by the Trump administration, noted FTA Acting Administrator K. Jane Williams in a statement. To date, FTA said it has allocated $1.86 billion of $2.62 billion in fiscal year 2018 CIG funds appropriated for projects by Congress, adding it will “continue to consider” additional FY 2018 CIG allocations, based on the merits of individual projects.